In today's rapid paced information age, reliable internet connectivity is pretty much taken for granted...ashore. Once on the water, getting connected at all can be difficult if not impossible. #1 Haul the laptop ashore in the dinghy and track down an internet cafe. #2 Tether a smart phone to the laptop. I won't go into pros and cons of above, but instead focus on obtaining 'free' internet access via shore side access points. Nothing is really free, but after the initial cost of installing a high power long range WIFI system, internet access can often be obtained for free. Even with a long range high power system, selecting an anchorage often comes down to availability of WIFI. Long Range WIFI system used on LightSpeed. Bullet 2HP wireless radio by Ubiquity. About $79 as of 12/17/2010 from many suppliers. 29dbm/800mw output which is 20+ times more power than a typical laptop. Signal strength LED meter for antenna alignment. Power input from 12-24 volts DC so it happily runs on ships 12volt system. Pros: Best quality and performance. A 12dbi would be fine for most. Power Over Ethernet (POE) Injector from Retailers. Provides power wireless radio from ships 12 volt system. About $50 new or $20 used online from various retailers. We use an old Linksys WRT 54G running DD-WRT firmware. You might have one already laying around the house and the older Linksys wireless routers are still a good choice. Still working on a good solution and will post pictures here mounted. Someone to Hook it all up and configure router. How to unlock the 'Ham' Frequencies on a Icom M802 SSB. Simultaneously press the "2" + "Mode" + "TX" buttons, and then turn on the power and the radio is 'unlocked'. For the more technical you can find some great programming software at this link: http://www.icomrecievers.narod.ru/ to automatically program the frequencies on your Icom. Enjoyed a great Thanksgiving at Sun Valley, Idaho with my sisters and families. 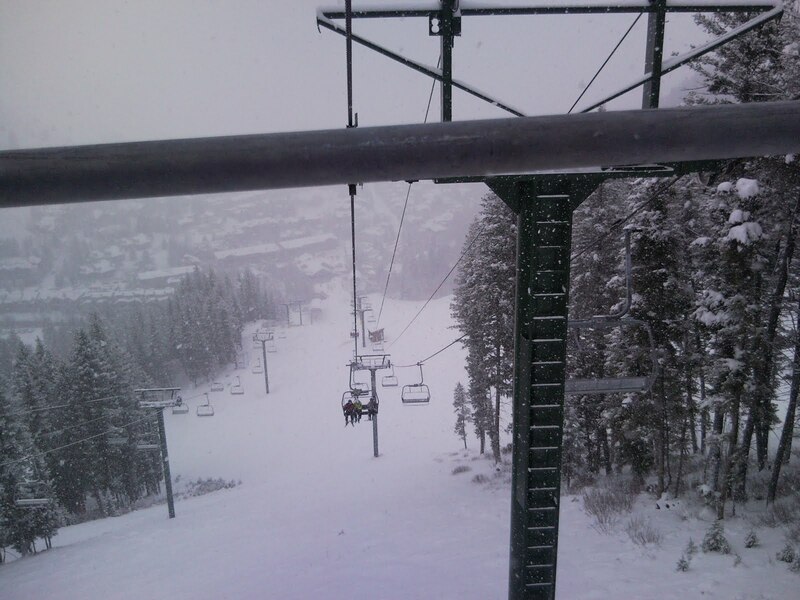 Even hit the slopes to see if we could remember how to ski after five+ years in the tropics. 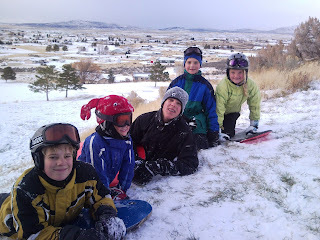 Bruce, Anne, Andrew, Tim and Jane sledding at Sun Valley, Idaho. We're now in Portland, Oregon to recharge our cruising kitty. Kathy is working for a biotechnology company and Dave is slowly working on a job while working on some boat projects. See the sidebar for our most current phone numbers. Check out this snow man... our first aboard LightSpeed. After our journey down the Washington Coast it was great to pull up to our friends dock on the John Day River. Shanon, Jasmine and Solice were great hosts and we look forward to sharing adventures in the future, hopefully some where warm. High and dry for a propeller change. Sailed into Victoria, BC today and will meet up with Kathy on Friday when she returns for a business trip to Atlanta, GA. Working on moving the boat to Portland, Oregon as weather conditions allow on the ocean. As I write I'm enjoying a great view of the Victoria Harbor with the government buildings trimmed with white lights and the majestic Empress Hotel glowing with warm orange lights that makes it look a little spooky as if they still have it decorated for Halloween. Victoria is one of my favorite cities so I'm happy to enjoy it while waiting for our weather window. This past weekend I raced LightSpeed in the Round the County race with friends Aaron and Kelley. The Round the Country Race is a two day event that takes sailors on a clockwise circumnavigation of the San Juan Islands in Washington State. The race was good fun and the focus of racing environment helped me learn a few things about sailing LightSpeed. The first day of the race we took things pretty easy and kept well clear of the boats battling for prime starting position at the line. We also were pretty lazy about flying our spinnaker when we should have. The second day we again steered clear of the start line antics and crossed the starting line pretty late, but with our spinnaker up. Our tactic worked well and we quickly caught the fleet and for a fleeting moment were in the top ten with the huge racing sleds. Then the wind filled in as we rounded Turn Point on Stuart Island and things got pretty dicey. A catamaran responds to the helm a little differently than sporty race boats. Maneuvering LightSpeed conjured visions of a clumsy giant at a full out run surrounded by scurrying mice. We held our own with faster boats on the downwind run, but our spinnaker is made for very deep wind angles compated to the A-symentrical spinnakers off the race boats. In the end the pointing ability of the cat vs. race boats had us out matched on the windward legs. Our tactics and sail handling were decent, but showed our minimal racing experience. Overall we placed 62 out of 72 on a corrected basis leaving lots of room for improvement on future races. Cruising certainly doesn't hone the technical sail trim required for racing so it was good to pay more attention to the details and experiment with what worked best. We've decided to recharge the cruising kitty (i.e put some money in the bank for future cruising adventures). This wasn't in our plan, but then Kathy stumbled into a great job working for a start up bio tech company. Kathy will be traveling frequently for work and Seattle seemed a natural place for me to find work. Unfortunately, the state of Washington would like to collect 9.5% 'Use Tax' based on the fair market value of the boat simply for the privilege of keeping the boat in Washington waters. We thought we could find a way to avoid or moderate the tax, but have exhausted all avenues without success. Moving on to 'Plan B' we looked at moving to British Columbia and perhaps obtaining Canadian Citizenship. The requite privileges of Canadian Citizenship such as long term health care, unencumbered ability to live and work in any of the Common Wealth counties were carefully considered. However, it would be a minimum of three years as permanent Canadian Residents to qualify for Citizenship and a hefty import tax on the boat of 14%. We really like the idea, but value our unconstrained flexible lifestyle too much for such a major commitment. 'Plan C' Oregon. No taxes on our boats and no long term commitment. The cons are State income tax and limited ability to actually use our boat as it will be 100 miles up the Columbia River in Portland and far from exciting cruising grounds in British Columbia. We've decided on Oregon and the next big challenge is delivering the boat to Portland from Seattle. Not too many weather windows this time of year and lots of strong Southerly wind and big swell to complicate crossing the Columbia bar. Racing in the 'Round the County' race this weekend (Around the San Juan Islands) then will look for a window to make the hop to Oregon. We are settled in Seattle and have the boat at Elliot Bay Marina. We are back in the USA after a 12 day trip to China. While in China I was only able to post to this blog one time before the Chinese Government implemented censorship to prevent access to this blog from China. I'd read about censorship in China, but was surprised that my blog would be censored. As it turns out many websites I tried to access in China were blocked. Good to be back to the land of mostly free speech. China was interesting. However, I don't anticipate traveling to China again given the many other travel options in the world that are less crowded and have better air quality. The last few nights we been enjoying a room at the International Youth Hostel Hiker located in the Bund area of Shanghai. Despite the association of hostels with youth, most hostels offer a range of accommodation options from bunk beds in dorm rooms and shared bathrooms to private rooms with en suite baths and cater to all traveler age groups. The hostel experience offers an opportunity to meet fellow travelers, share information and make new friends along the way. Most hostels have a communal kitchen, dining room, TV room and sometimes feature a restaurant and bar. Nine times out of ten we'd choose a hostel over a hotel simply for the social factor vs the isolation of another ubiquitous hotel room. We lucked out finding a great base for our stay in Shanghai. Although, technically a youth hostel our accommodation is pretty deluxe, located on the top floor it's a tastefully decorated corner room, featuring a king size canopy bed, en suite bathroom, super high ceilings, A/C, ceiling fan, a large desk, couch, table, small armor, and 32”flat screen. A remarkable value for 360 yuan or about $54USD a night considering the location and the amenities. Shanghai offers a travelers a juxtaposition of experiences. Really no surprise when you consider it's the most populous city in the world at around 14 million (4 times the size of Los Angles and with twice the population density). Ultramodern skyscrapers replete with posh restaurants and suave night clubs vs literal hole in the wall restaurants and street side vendors serving up traditional fare to fill a wayward traveler for less than a dollar. A 600ml beer at a corner market is less than fifty cents vs the same beer at a restaurant is three dollars and way up. Dinner for two at a local dumpling shop filled us up with tasty food for less than three dollars vs a city view restaurant in a high rise where you'd be lucky to escape with your wallet only one hundred dollars thinner. Our hostel is located near the shopping meca of East Nanjing Road an extravaganza that stretches 6 kilometers and boasts over 1 million visitors every day. A pedestrian mall running from Peoples Square to the Bund offers a truly dizzying array of shopping possibilities and plenty of street hustlers offering visitors an opportunity to visit even more shops that line the adjacent streets. The street hustlers begin to sound like broken records as they offer small variation on their pitch. 'Excuse me sir what you looking for? A watch, bag or tee shirt' , 'Good shopping this way' as you continue to ignore the barrage of hustlers they continue to pace you and repeatedly ask 'what you looking for'. Within one block of the prime pedestrian mall of East Nanjing Road you might get five or more hustlers hounding you. My best advice is to absolutely ignore their existence. The smallest flinch or flash of eye contact will only prolong the unwanted interaction to the point that you would never walk more than a block in an entire afternoon. Outside of the prime tourist shopping areas all is normal and you enjoy your sightseeing and exploration of the city unperturbed. Initially, we were expecting to make plenty of purchases during our visit to Shanghai. Since nearly everything is made in China we thought we could swoop in on some sweet deals. However, with the high pressure, mildly annoying sales atmosphere, requisite heavy negotiation and many inferior quality 'knock-off' goods we've decided we'll save our shopping for the USA. To be fair super high end, quality goods are available, but at prices for the rich and famous. One conclusion we've drawn after a fairly significant amount of world travel is that shopping in the USA generally offers superior selection, availability, and quality. This weekend we're headed for scenic Hangzhou about 120 kilometers from Shanghai. Located on the scenic West Lake the area includes plenty of historical pagodas cultural sites to visit. Hangzhou is rated as one of the top ten most scenic cities in China. After booking a high-speed train from Shanghai to Hangzhou I was a little shocked to find that this 'must see' city we'd be visiting has a metropolitan population of over 4 million which is bigger than Los Angles. The scale of China is slightly beyond incomprehensible and with a population in excess of 1.3 billion I suppose a city of a few million can still be 'natural and scenic'. We've been in Shanghai for 24 hours. This is a big, bustling city and impressive city are we are impressed. So far we've mastered the very user friendly subway system and track down a cool hostel to stay at in lieu of a 'normal' motel. With a 13 hour time change, jet lag is a big deal with our internal clocks almost completely out of sync.